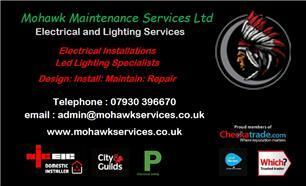 Mohawk Maintenance Services Ltd - Electrician based in Birchwood, Cheshire. Electricians with over 30 years' experience in Commercial, Domestic and Industrial installations of all types. We provide a polite, professional service, a written quote along with a clear copy of our terms and conditions stating our fees and never charge a call out fee. All our work carries a 12 month no quibble guarantee on parts supplied by us as well as labour and technical advice.